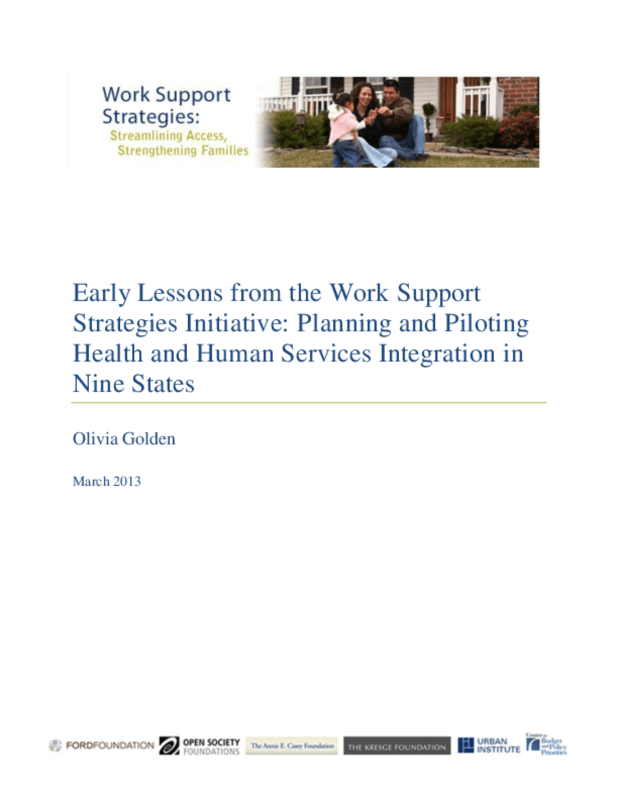 In 2011, nine states -- Colorado, Idaho, Illinois, Kentucky, New Mexico, North Carolina, Oregon, South Carolina, and Rhode Island -- received one-year planning grants under the Work Support Strategies (WSS) initiative to help them improve their systems for connecting low-income families to work support benefits. These planning grants were the first phase of WSS, a multiyear initiative to help selected states test and implement more effective and integrated approaches to delivering key work supports, including health coverage, nutrition benefits, and child care subsidies. The idea behind the project was that more streamlined and modernized processes could help low-income working families get and keep the full package of work support benefits for which they are eligible. In turn, having the full package of benefits can stabilize families' work lives and promote children's health and well-being. Streamlining benefit delivery can also reduce the burden on state workers by further stretching states' scarce administrative dollars and potentially saving money. This report summarizes the lessons learned from the nine planning grant states, just one year into a four-year project. Future reports from the evaluation will follow the six states that continued into the three-year implementation phase (Colorado, Idaho, Illinois, North Carolina, Rhode Island, and South Carolina). We will document their implementation experiences and track results for families and for state administrative efficiency. In a subset of the states, the evaluation team will also analyze the impact WSS had on those results.